Tajikistan (/tɑːˈdʒiːkɪstɑːn/ ( listen), /təˈdʒiːkɪstæn/, or /tæˈdʒiːkiːstæn/; Тоҷикистон [tɔːd͡ʒikɪsˈtɔːn]; Russian: Таджикистан), officially the Republic of Tajikistan (Tajik: Ҷумҳурии Тоҷикистон, Çumhuriji Toçikiston, Russian: Республика Таджикистан), is a mountainous, landlocked country in Central Asia with an estimated population of 8.7 million people as of 2016, and an area of 143,100 km2 (55,300 sq mi). It is bordered by Afghanistan to the south, Uzbekistan to the west, Kyrgyzstan to the north, and China to the east. Pakistan lies to the south, separated by the narrow Wakhan Corridor. Traditional homelands of Tajik people included present-day Tajikistan, Afghanistan and Uzbekistan. The territory that now constitutes Tajikistan was previously home to several ancient cultures, including the city of Sarazm of the Neolithic and the Bronze Age, and was later home to kingdoms ruled by people of different faiths and cultures, including the Oxus civilisation, Andronovo culture, Buddhism, Nestorian Christianity, Zoroastrianism, Manichaeism and Islam. The area has been ruled by numerous empires and dynasties, including the Achaemenid Empire, Sasanian Empire, Hephthalite Empire, Samanid Empire, Mongol Empire, Timurid dynasty, the Russian Empire, and subsequently the Soviet Union, upon whose dissolution in 1991 Tajikistan became an independent nation. A civil war was fought almost immediately after independence, lasting from 1992 to 1997. Since the end of the war, newly established political stability and foreign aid have allowed the country's economy to grow. Tajikistan is a presidential republic consisting of four provinces. Most of Tajikistan's 8.7 million people belong to the Tajik ethnic group, who speak Tajik (a dialect of Persian). Many Tajiks also speak Russian as their second language. 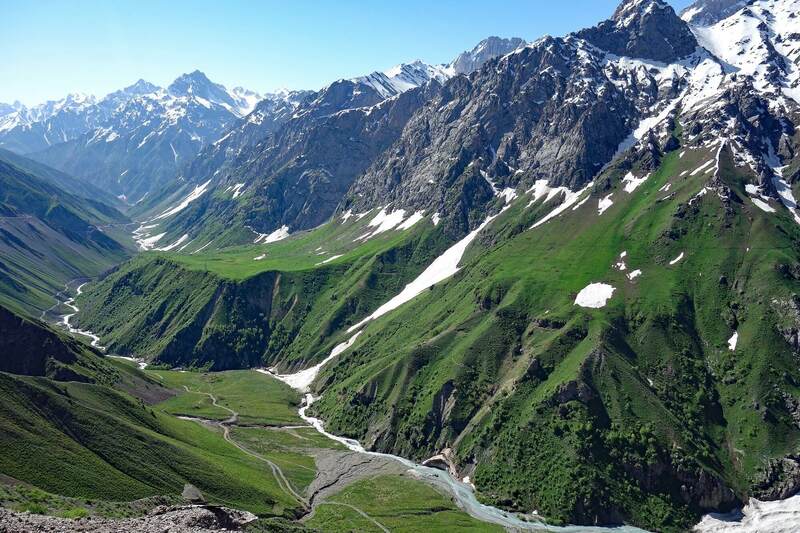 The Gorno-Badakhshan Oblast of Tajikistan despite its sparse population is home to incredible linguistic diversity where Rushani, Shughni, Ishkashimi, Wakhi and Tajik number among the languages spoken. Mountains cover more than 90% of the country. It has a transition economy that is highly dependent on remittances, aluminium and cotton production.